This is the ninth in a series of posts on this week’s OSCE “Human Dimension Implementation” meeting in Warsaw. More will be coming later this week. See the list of links at the bottom of this post for previous articles. This report was written by Elisabeth Sabaditsch-Wolff. She was part of a team representing the civil liberties organizations ACT! For America, Bürgerbewegung Pax Europa (BPE), the Stresemann Foundation, and the International Civil Liberties Alliance (ICLA). Alain Wagner (France) is the leader of the Stop Sharia campaign and a co-founder of the International Civil Liberties Alliance (ICLA). David Erzet (Belgium) represents the International Civil Liberties Alliance (ICLA). Dave Petteys (USA) represents ACT! for America 5280 Coalition. Felix Strüning (Germany) is the managing director of the Stresemann Foundation — A Lobby for Freedom. Henrik Ræder Clausen (Denmark) represents the International Civil Liberties Alliance (ICLA). Liz Schmidt (Germany) represents Bürgerbewegung Pax Europa (BPE-Austria). Elisabeth Sabaditsch-Wolff (Austria) is a board member of Bürgerbewegung Pax Europa (BPE-Germany). A sizeable delegation of representatives of the Counterjihad are currently attending the OSCE conference, called ‘2012 Human Dimension Implementation Meeting’. In this gathering the status of human rights within the OSCE region is discussed in a plenary comprised of diplomats from participating States (OSCE lingo for member states), representatives from international organizations and, most importantly, representatives from civil society. Readers should be aware of the high status accorded civil society within the OSCE, a status not granted at any other international organization worldwide. We enjoy total equality with participating States, meaning that we have the right to speak; as a matter of fact, so-called “interventions” are encouraged in the plenary, with the diplomatic delegations holding the exclusive right to reply. The last time I attended an HDIM meeting was back in 2009, after which I was reported to the authorities in Austria and was tied me up by legal case for the following two years, as most of you know. A delegation from ICLA was present last year. Here are some observations from yesterday’s all day event concerning “Freedom of thought, conscience, and belief”. 1. Contrary to expectations, the speakers’ list was full, but not overloaded. Everyone who had something to say got a chance to say it. This was taken advantage of by representatives of ICLA, BPE, ACT! for America 5280 Coalition and the Stresemann Foundation. 2. Interestingly, the chairwoman was wearing an Islamic veil. While obviously Muslims may hold the important chair, one could rightfully demand that during those hours they put aside their personal religious beliefs and neutrally represent the function they serve within OSCE. 5. BPE and ICLA replied to the threat, voicing our concern that the plenary and the OSCE as such is the wrong place for threats and that this kind of behavior must be rejected. 6. The European Muslim Initiative for Social Cohesion then took the floor again, singling BPE out by saying that we spread lies about Islam. He was extremely angry. I was glad we were in a plenary because I could feel the rage flying across the room. The OIC side obviously did not expect to be on the defensive. 7. This is one of the important observations we made yesterday: The tide has shifted. The freedom lovers are no longer on the defensive; the opposite is true. The OIC side was isolated; the Counterjihad received many supportive thumbs-up gestures. We made new allies. 8. Lastly, I was more than surprised to see a member of MPAC take the floor on behalf of the US delegation. Since when has MPAC represented the U.S. government? And with diplomatic status! This is wrong and an outrage. We ask our friends in the U.S. House of Representatives to weigh in. With the U.S. Constitution hanging in the balance and the First Amendment being threatened by the Muslim demand to criminalize “Islamophobia”, it was bizarre to see the U.S. delegation ignore the elephant in the room by being preoccupied by LGBT issues and posing as “Defenders of pluralism”. Though I abhor using these words, my final thoughts are as follows: The battle has begun. The two sides — defenders of freedom and the lovers of death and submission — are now in direct opposition. May the forces of human good prevail. Our children deserve no less. 8 What is Medica Zenica? 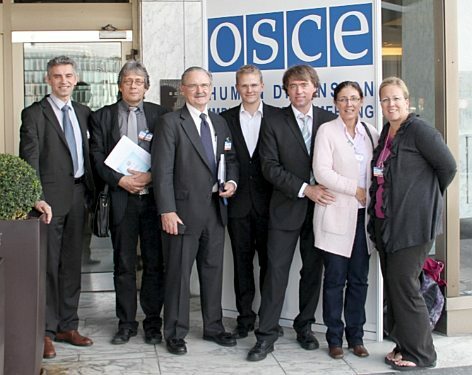 2012 Oct 2 OSCE Warsaw: Which Human Rights? 2 OSCE Warsaw: Join the Brussels Process! 2 OSCE Warsaw: Define Your Terms! Onward to victory! These people are heroes for standing up for our rights.